This monograph sets out to investigate how Kazuo Ohno, (1906-2010) the then world’s eldest butoh performer, conducted dance education during his 38 year long tenure as gymnastics teacher and subsequently caretaker at the Soshin Baptist Girls’ School in Yokohama. Essentially focusing on Ohno's training methods in dance class and the manner in which he directed the annual Christmas Nativity play, this research also explores the bearing his lifelong educational activities had upon the creation of his world-renowned butoh performances. 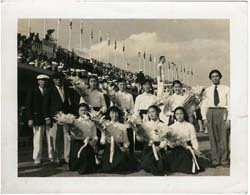 In addition to collecting and examining relevant documents and photographs at the Kazuo Ohno Archives, the Soshin School and from other sources, research also entailed conducting a series of semi-structured interviews with current and former members of the school's staff along with a chosen group of past pupils. Ohno's creative output and pedagogic methodology are examined from the following perspectives: chronologically - as seen in the tables relating to education and his butoh works; and pedagogically - as described in the sections on dance instruction, the group choreography for Beauty and Strength; the annual Christmas Nativity pageant and playing Santa Claus for the children. The findings reveal that Ohno's unconventional approach - for he did not emphasise form - positively encouraged students to confront and express themselves freely and in the process draw out their inner selves. As an educator and a performer Ohno was invariably humble and thoroughly dedicated to his art and chosen profession, and yet compassionate in his dealings with others. Notwithstanding his international fame his teaching methods never changed; he constantly harnessed his pupils' full human potential while embracing the universal themes of life and death. Manifest in every sphere of his life, Kazuo Ohno's way of teaching offers a bountiful source for future instructors of dance and practitioners alike.